Local artist Mat Tomezsko’s 14 Movements: A Symphony in Color and Words will run along 14 blocks of S. Broad Street. With the Democratic National Convention fast approaching in Philadelphia, city officials and local organizations are doing everything in their power to impress the estimated 50,000 people who will enter town to nominate a candidate from July 25-28. 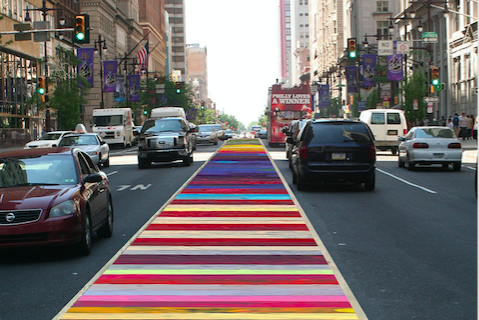 In a city world-renowned for its murals, that means decorating our main thoroughfare — Broad Street — with a colorful median that will stretch 14 blocks from City Hall to Washington Avenue. The ground installation, entitled "14 Movements: A Symphony in Color and Words," is part of a collaboration between the Mural Arts Program, the 2016 DNC Host Committee and the Philadelphia Horticultural Society. “The convention provides us with a great opportunity to continue the city’s ongoing beautification efforts taking place across the city,” said Mayor Jim Kenney. “Enhancing parts of North and South Broad Street will enable the Convention to have a lasting impact on the streetscape of a main corridor running through the city." Mural artist Mat Tomezsko, a graduate of Tyler School of Art, envisioned "14 Movements" as a colorful stripe with patterned imagery and scattered words taken from Philadelphia Poet Laureate Yolanda Wisher’s collection, "Monk Eats an Afro." DNC lighting array at City Hall. "Tomezsko’s painterly symphony represents the desire of all people to be seen, heard, and represented, and reflects the importance of placing open discussion and the exchange of ideas at the forefront of our democratic society," the Mural Arts Program said in a blog post. On the north side of City Hall, the Philadelphia Horticultural Society will partner with the Host Committee and the Department of Public Property to install 52 planters from City Hall to the Convention Center. A series of new perennial garden plantings will be arranged through a project with Roots to Re-Entry, a PHS program that helps citizens transitioning from prison by providing employment opportunities in the horticulture and landscape industries. “This beautification effort is the beginning of a larger plan for this section of Broad Street, and PHS is grateful to the Philadelphia 2016 Host Committee for this opportunity to work with partners who have a shared vision for Center City’s public spaces,” said PHS President Matt Rader. 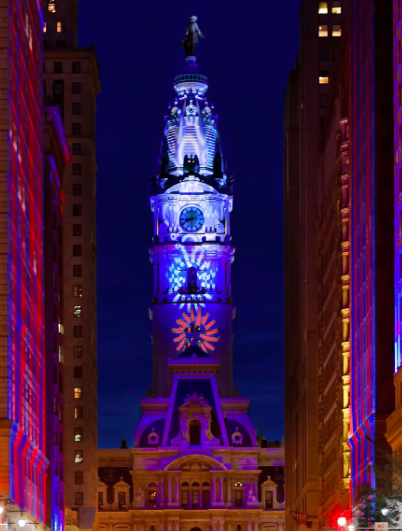 On the South facade of City Hall, Center City District will install a temporary lighting array with red, white and blue bulbs programmed to synchronize color switches and project moving images. They will be active from dusk to 4 a.m. every night from July 23-28. City officials and DNC organizers are expecting the four-day event to bring in about $300 million as party delegates, media members, lobbyists, and constituents fill up hotels, pack restaurants and spend in Center City. That's against approximately $150 million laid out by the DNC's convention committee and Philadelphia's Host Committee. In 2000, the GOP convention in Philadelphia generated about $345 million. The three projects above are among more than 10,000 enhancements and fixes planned at locations around the city for the DNC. Most prominently, residents and visitors will encounter 57 fiberglass donkeys displayed at various sites and attractions throughout Philadelphia.